For most of the last two weeks of September I was working on a collections project aimed at auditing, repacking and photographing the UCL Physiology Collection. Although the collection itself consists of only 82 objects (for now), it shares its store room with a large number of additional objects, papers, books and other ‘misc’ material. It was quite a job, and took 5 of us the best part of two weeks to complete. Among the objects and papers we saw during the work were two 20th century dog respirators, half a door, papers relating to experiments on Everest and lots of framed portraits and photos. Included in this last lot was a particularly perplexing object, which caused us all to scratch our heads for a while. 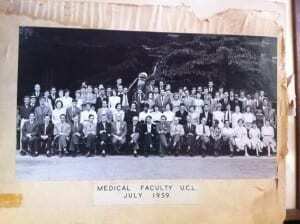 Medical Faculty 1957, with troll (middle back). holding an umbrella and tin helmet. 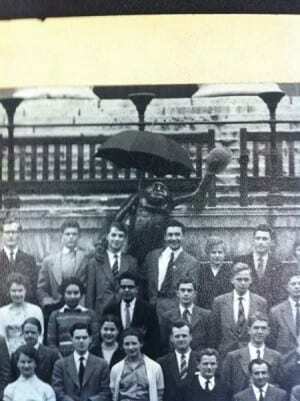 It’s hard to make out at first, but there is what appears to be a troll at the back, holding an umbrella in one hand and a tin helmet in the other. 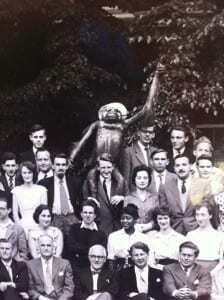 Looking closer there seems to be a third hand draped over a man’s shoulder in front of the troll. I know that UCL had a number of firsts – first university in England to admit non Church of England Students, first to teach women, the first to admit students from Japan; is this the first example of a mythical animal getting a medical degree? The answer showed itself soon after, in a photo titled ‘Medical Faculty UCL July 1959’. Here the identity of the ‘troll’ becomes clear. Instead of a troll, it’s now is clear that it is an orang-utan. Which is slightly unusual, but less hard to believe than the medical faculty having a troll for a mascot. Medical Faculty UCL July 1959, with orang-utan. Close up of the orang-utan (not troll). Ready for summer. The orang-utan appears to have a scar running down its belly, which could suggest its origin – possibly it is an animal that had been tested on. A quick check with the Grant Museum shows it is not their orang-utan. So what’s happened to it now?! 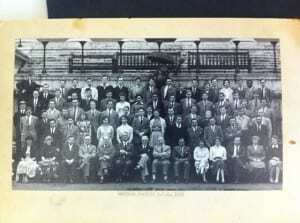 Nick Booth is one of the Teaching and Research Curators at UCL.